Nineteenth-century New York City was one of the most magnificent cities in the world, but also one of the most deadly. Without any real law enforcement for almost 200 years, the city was a lawless place where the crime rate was triple what it is today and the murder rate was five or six times as high. The staggering amount of crime threatened to topple a city that was experiencing meteoric growth and striving to become one of the most spectacular in America. 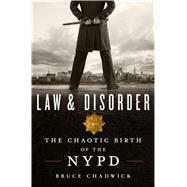 For the first time, award-winning historian Bruce Chadwick examines how rampant violence led to the founding of the first professional police force in New York City. Chadwick brings readers into the bloody and violent city, where race relations and an influx of immigrants boiled over into riots, street gangs roved through town with abandon, and thousands of bars, prostitutes, and gambling emporiums clogged the streets. The drive to establish law and order and protect the city involved some of New York’s biggest personalities, including mayor Fernando Wood, police chief Fred Tallmadge, and journalist Walt Whitman. Law and Disorder is a must read for fans of New York history and those interested in how the first police force, untrained and untested, battled to maintain law and order. BRUCE CHADWICK is the author of 29 books. A noted historian, Chadwick taught at Rutgers University and New Jersey City University. He covered crime for many years as a reporter for the New York Daily News. He holds a PhD from Rutgers and he lectures on the history of crime and forensics all over the world.